Surf’s up at this ground-level unit, just one house from the beach. With a prime location minutes from Newport Beach’s best surf break, this laid-back hideaway is a dream come true for swell chasers. Spend the day riding waves, then come home for afternoon barbecues on the patio or evening chats by the fireplace. The living area blends total comfort and beach vibes. Settle into a plush sofa or armchair for a movie on the flat-screen TV or board game on cool nights night beside the gas fireplace. With a fully equipped kitchen, you’re set for everything from pack-and-go beach picnics to dinnertime seafood feasts. Large cabinets mean plenty of room for groceries, and brand new counter tops provide plenty of prep space. Fuel up in the morning at a breakfast bar with room for three, and linger over dinner at the dining table with seating for six. An open concept design means sunshine abounds throughout the entire common space, and a dining room ceiling fan keeps you cool all year round. Extra spacious and tastefully appointed with beachy accents, the master bedroom with ceiling fan offers a welcome retreat at the end of a day on the sand. With ample closet and wardrobe storage, plus an attached bath with tub/shower combination, getting ready is easy. Younger guests will love having their own space in a serene, nautical-themed second bedroom, with two twin beds, ceiling fanand dresser storage, plus an adjacent bathroom with walk-in shower. Even when you’re not at the beach, you can soak in the sunshine on the private enclosed patio, located just off the living space. Fire up the BBQ for low-key dinners and dine around the table for four. Unroll the umbrella in the afternoons for cold drinks and a little bit of shade. From beach chairs to boogie boards, store all your gear in the secure outdoor closet. Other extras include a separate bay garage with one parking spot and washer and dryer in the garage. 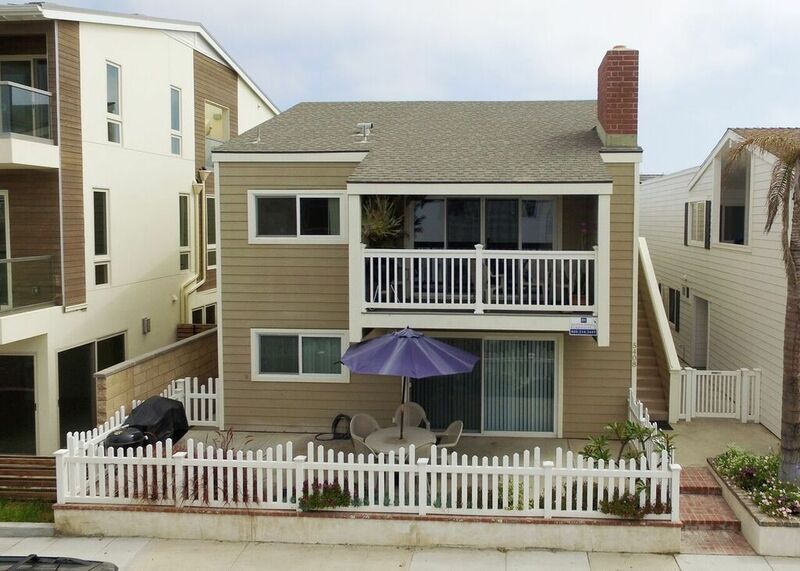 Whether you’ve come to ride the waves or just watch the pros, this location between 54th and 55th Street places you just one house away from the beach and a short stroll from Newport Beach’s best surf break. ASP Pro Junior Surf Tour, Volcom’s VQS World Championships, NSSA Open Season Events, and the Quiksilver Surf Shop Challenge all take place just moments from your door. Spend an afternoon stretching your land legs at West Newport Park—a grassy, beachside spot just a few blocks away—where you can practice your backswing on the tennis courts and let the little ones burn off energy at the playground. Here, you’re surrounded by plenty of options for shopping and dining. Travel across West Coast Highway for casual eateries like Eat Chow and Spaghetti Bender, or head to Newport Boulevard for seafood restaurants, taco joints, and more along the water. The unit is well stocked, clean and ready for occupancy. The upstairs tenants are friendly and warm people. However,the building structure allows all upstairs noise to penetrate trough the ceiling to the rooms below including any walking, toilet and shower use and we could even hear the dogs scratching as their tails banged against the floor. The tenants were considerate, the hardwood floors transferred every sound. Also, the street is akin to a Newport Bath House with surfers changing from clothes to wet suits and back again including bringing their own water to shower and rinse and dry off. They were as polite as they could be, covering up with towels as they changed---but there they were morning, noon and evening. Sitting on the patio was an interesting activity. We have been going to Newport Beach for our summer vacation for 41 years! We never stay in the same beach house! This is the farthest down the beach we've stayed and it was still good! Upon check-in, our beach house was not ready. We did have to wait an hour for the maids to finish. They hurried through and some things weren't up to par but we managed. Burr White was great when we needed a package overnighted. We called their office and had it sent to them. They called the next morning as soon as it arrived! The only thing that didn't work was the shower handle in the hall bath. It came off but my husband fixed it. Both need to be upgraded. They are hard to adjust. Also, the shower door came off the tracks. We also fixed that. I forgot I was going to leave a note for the maids to replace 3 light bulbs that were burnt out. Check-out is at 11 am. The maids were at our unit by 10:20. I wish I would have called for a late check-out. I know Burr White would have accommodated. Nice home, perfect for a family of three or four. Very conveniently located - within walking distance to Pavilions Grocery and steps from the beach. Could use a little TLC - especially in the bathrooms. Loved the patio. Laundry & garage bonus! We are so happy you enjoyed your stay and look forward to seeing you on your next Newport Beach vacation! We look forward to seeing you on your next Newport Beach getaway! Winter home away from home! We absolutely love this property, a beautiful and comfortable reprieve from Michigan winters. This space is clean and well kept, nice patio space and close proximity to beach. Customer service, although only needed on two occasions, was addressed immediately and they took care of everything. Will definitely rent again! The day before we were to leave our reservation was changed. we did need the beach. We needed a location near my daughters home. We had no choice but to accept the changed since the car was loaded. Opposite direction from daughter.Front yard smaller than the one we chose. dog needed more room. We didn't need a bigger house.Bathrooms grungie. We strive to provide an outstanding experience for every guest. Unfortunately, the property that you originally reserved became unavailable due to emergency maintenance and every effort was made to move you to a property that was as close to your desired location as possible. We apologize for any inconvenience you experienced and hope that you enjoyed spending the holiday with your family. We have been renting a house during the summer for 18 years. It's our families favorite vacation place. We are honored to be a part of your family tradition and look forward to seeing you for many years to come!